I sewed something! I had one meter of this fabric I had bought in Germany. It wasn't enough to do much with, but L suggested a jacket, so that's what I decided to do! I was inspired by Jenny Rose's green jacket with the ruffle . I had just enough fabric for it and I had a nice little pile of scraps left. I used nearly all of the fabric and I was really careful how I laid out the pieces! Also, I did go a little out of my comfort zone and came up with a pattern that fit me for the back. Usually I do enforreau backs because I find them easy. But this turned out really well and I'd use it again! I'd like to make a cream silk petticoat to go with this. Right now it's just over a plain linen one. I do have lace sleeve flounces that I'll probably wear too. The lace at the neck is vintage, bought at an antique show. Every now and again I like to make a list of all the stuff I'd love to have/make. It doesn't mean it will happen, but it's nice to sometimes re-evaluate and decide if your tastes have changed, and to focus on the things you'd like to work on. Who wants leather 18th century shoes? In lots of colors? And normal widths this time? I pinched these from other people. 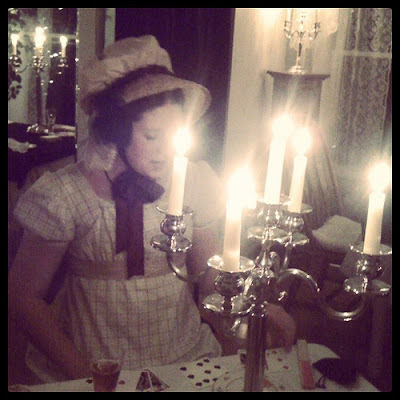 Here are a few pictures from the Regency card party I went to last night! Here are a few pics of me at the party tonight. I have a bunch more pics of everyone else (and everyone looked so great!) which I'll post tomorrow because I'm really really tired after the long drive home. I had a great time though! Here it is with trim - I didn't have quite enough for what I wanted to do, but oh well. I also kind of want to redo the sleeves a bit to make them less poofy. They don't look poofy here, but they are a little bit poofy on. My friend Amber just brought me back this shawl from Afghanistan, and it matches nicely I think! 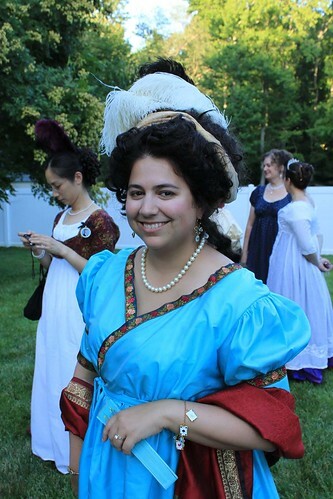 I redid the bodiced petticoat I threw together for my white regency gown. I made the back higher (it might be a smidge too high now? I don't know. Anyway, it's much better than it was. And I made buttonholes!! Nothing fancy. Aqua 1790s gown - almost done! Well, my dress is finished - except for the trim. I had a lot of trouble finding trim I liked, or that I had enough of. I've since ordered some stuff that I think will work, but I'm not sure whether it will come in time for the party I'm intending on wearing this too. I may baste some temp trim on, or just wait. So, the finished gown doesn't look totally like the fashion plate yet! And my gown! 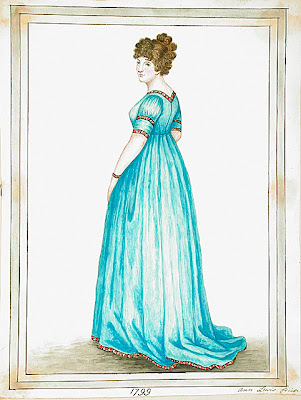 I modified the Sensibility pattern I used for my last regency dress, just making the bodice longer. The pattern came with a wrap front, which I modified slightly. I did use the under layer so that the pleats would work and the bodice would be fitted. A Young Girl’s (Lily Phillips) bodice and apron worn in the 1999 Tim Burton horror film Sleepy Hollow. The girl can be seen in the early scenes of the movie dancing around inside the Van Tassell household as Ichabod Crane (Johnny Depp) arrives to solve the town's superstition of the Headless Horseman. The padded cotton garment is coloured an earthy brown and decorated with embroidered autumnal coloured leaves and stems, and features lace frills around the cuffs and neckline. 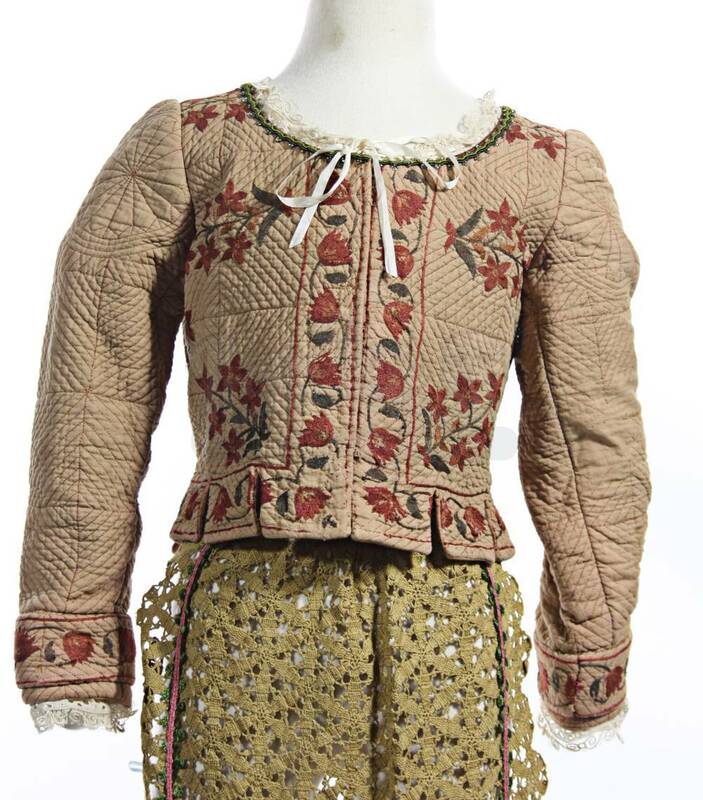 It fastens at the front with hooks and eyes with robust versions inside for holding up the skirt and also included is the dull yellow over apron made from crocheted cotton and tied at the side with strips of lace. There are no sizes marked and is in excellent condition. Last month I put this shirt that was in the movie Sleepy Hollow on layaway at Propstore.com! 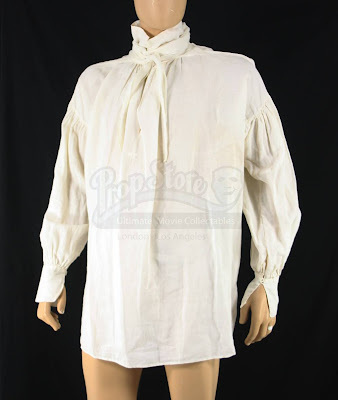 I thought if my husband ever wanted (or if I wanted him) to go to an event, he'd have an 18th century shirt! Plus, Sleepy Hollow! I have one costume from it, the midwife's gown, and the construction is beautiful. I'm hoping this will be nice too. A white shirt worn in the 1999 Tim Burton and Johnny Depp movie Sleepy Hollow. This style of period garment was worn by many of the inhabitants of Sleepy Hollow, the small town haunted by tales and sighting of the Headless Horseman. 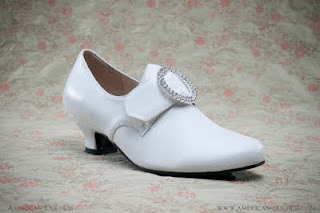 It is made from cotton and has distinct bunching around the cuffs, shoulders and collar with interesting hoop buttons. It also comes with a very fine cotton neck scarf seen around the men’s necks in a traditional knot. There is no name or size marked inside and is a piece from the movie that sees very few costume pieces surface. I was browsing on one of my favorite antique sites and I saw this gorgeous Georgian playing card bracelet that dates to 1810 or perhaps earlier. 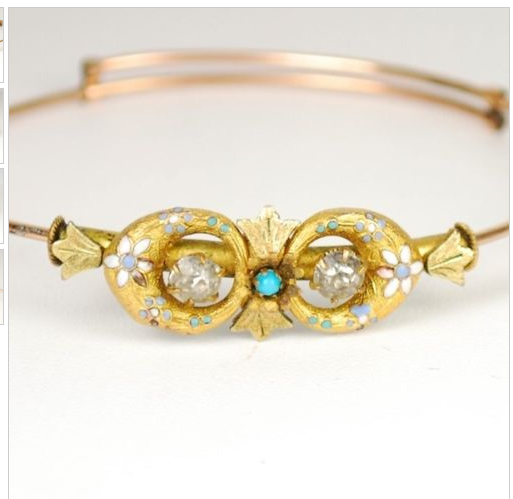 I'm going to a regency card party in a few weeks, so this really caught my eye. 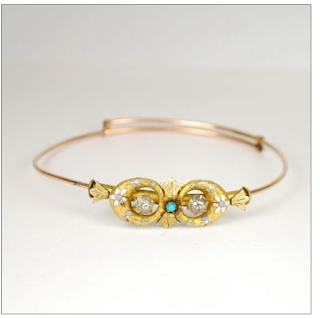 Sadly, I do not have a spare $1850 to buy it. 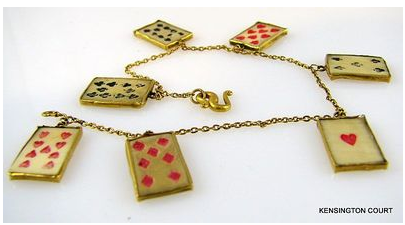 But I did remember that I had some playing card buttons I bought at Bocage - so I thought I'd play with them. They do have shanks on the back, which I should probably try and remove. 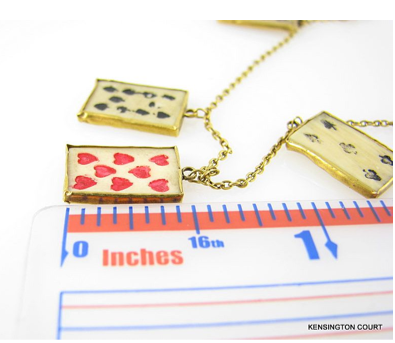 But I did have some chain on hand, and some gold foil. So I glued it around the edges of each button, and then a glued a jump ring on using another small piece of foil over it - and voila! My own much cheaper bracelet! Not perfect, and not the same, but not too bad for using things I had on hand! I made a Facebook fan page for Costumer's Guide! I have no idea how much I'll update, but you never know. I tweet every once in a while.